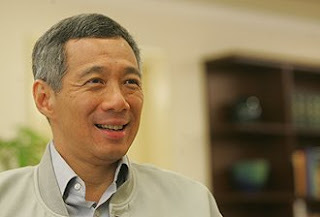 THE Government will leverage on new media in the next General Election, Prime Minister Lee Hsien Loong has said. In an interview with Channel News Asia to be aired on Tuesday night, he noted the growing influence of the Internet on politics, citing the recent United States presidential election as an example and said Singapore would go the same way. President Barack Obama's campaign, for instance, used new media to put out their messages, organise and even raise money. But PM Lee said the change here will not be an an easy one. He also said the party was on the lookout for more MPs comfortable with new media. His remarks are the latest sign of the Government's changing mindset towards new media. Last month, Minister for Information, Communications and the Arts Lee Boon Yang said that the Government is 'fully into' e-engagement, when responding to suggestions made by the Advisory Council on the Impact of New Media on Society. Since then, Government agencies have also begun responding to forum letters posted on The Straits Times website. PM Lee stressed, however, that traditional media will always have a place in presenting trusted, unbiased and informed opinions. But he didn't dismiss online views outright. 'Well, there is a place called the Wild West and there are other places which are not so wild. And the new media - some of it are Wild West and anything goes and people can say anything they want. And tomorrow take a completely contrary view and well, that is just the way the medium is,' he said. The interview on the evolving media landscape was in conjunction with Channel News Asia's 10th anniversary in March. I believe the evolution of tapping on new media in Singapore is possible. But evolution means it will take time to grow through stages of change, trial and error. And I agree that real name should be used. A blogger, Angelina_jo mentioned, "May be our PM still does not get it, Sporeans cannot use their real names esp if they are against Govt policies, for fear of reprisal." I think the concept has to be put right first. Being "Against" has to be with grounds and rational. If accompanied with constructive suggestions and evidence, then the word "against" no longer applies. I would think, when Singaporeans first decide to speak, appropriate and respectful language should still be used. Ultimately, respect is essential for any conversation. Be it to the government or simply your neighbour. Only with due respect, would anyone be interested to listen. And if someone chooses to speak up, make sure its a valid statement and not simply some form of intended scandal and message of angst. I am sure both public and government can make out the difference between the two. The Internet has a long memory and even our government understands that. SG government is wise enough to know what advices are to be taken positively and negatively. Just a reminder, our island's success is by no chance simply a case of luck. But again, USING the new media platforms is not equivalent to UTILIZING the new media platforms. Obama had a Social Media Head. Does our Singapore government have one? Training to get the staff hop on the social media wagon may not be the best way to implement these measures. Focus, time and in depth understanding of netizen behaviours and social media scope of influence is essential to the success of such a campaign. Obama has been crowned the best marketer of the year by adage. His online strategy was a revolutionary well planned case of Digital PR and marketing combined. In a moderated society like Singapore, the extensiveness of such an effect probably cannot be matched.